Active Agenda is a collaborative, browser based software application designed to help organizations manage risk. It has also been referred to as a "highly iterative, rapidly customizable, collaborative communication framework." Active Agenda development began in 1995 as an attempt to solve the problems of an operational risk manager faced with the challenge of implementing a national risk management program. Development soon evolved into an effort to launch a proprietary product into the territorial and market controlled environment of the insurance and risk management industry. Original efforts to develop Active Agenda as a proprietary product were met with a multitude of investment, market, and development controls. In September of 2003, the founders of Active Agenda began to aggressively research the open source movement and its underlying philosophies. The founders recognized the basic tenants of open source development projects as a possible solution for building and distributing innovation within an industry controlled by a few companies that thrive on the absence of innovation. Later the same year, the founders of Active Agenda decided to rebuild the Active Agenda product from the ground up, using open standards and open source technologies. The founders released the first source code on SourceForge.net in October 2006, along with a launch article published in Occupational Hazards Magazine. stuck with it; no matter how long it took, and no matter how great became the darkness or the pressure. At project launch, Active Agenda's founders had crafted more than fifty operational risk control modules to act as the initial platform for product evolution. Active Agenda contains more than one hundred modules today. Reciprocity is a central tenet of our project. This is why we distribute Active Agenda under the Reciprocal Public License. We believe in the freedom of open source, but we think freedom and responsibility are inseparable values. We believe open reciprocity can fuel innovation and expedite solutions to big problems (e.g. global risk). In January 2010, Active Agenda's founders made the decision to refine and enhance Active Agenda in a private repository, while supporting the open source project at the speed and frequency of reciprocity. We are presently searching for a project underwriter(s) and the right people to help us achieve our mission. The Active Agenda project was named a "FAST 50 Reader Favorite " by the readers of Fast Company Magazine. 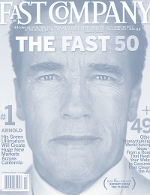 The Fast 50 is Fast Company magazine's annual readers' challenge, a global search for people doing extraordinary things. Fast Company received hundreds of nominations, which were rated and commented on thousands of times. Active Agenda's open source project and platform is currently being deployed by banks, hospitals, universities, wineries, government, airlines, and other industries. Unable to sustain themselves on the reciprocity of those using Active Agenda, the founders sought strategic guidance from pioneers in the open source community. 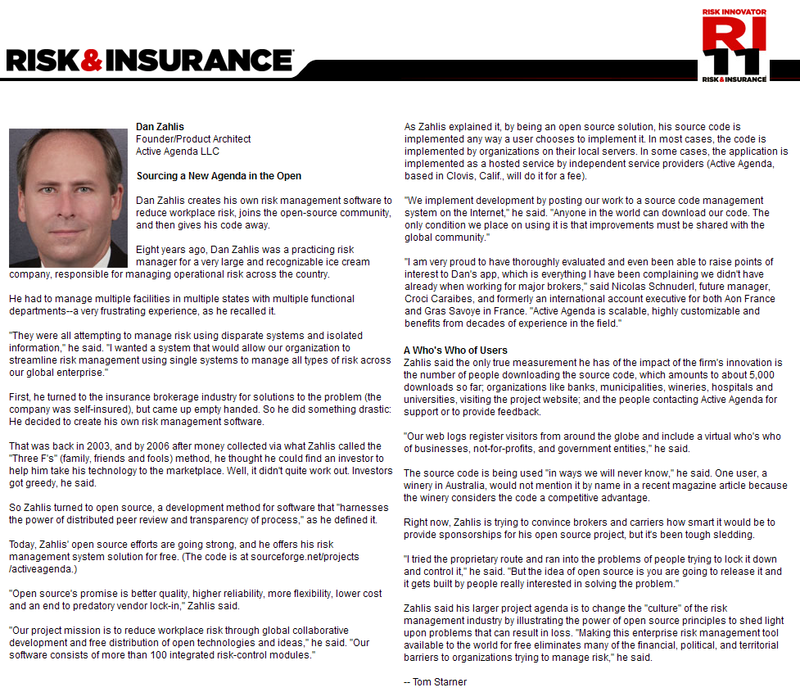 Active Agenda was awarded the designation of Risk Innovator™ by RISK & INSURANCE magazine. The Risk Innovator™ Award recognizes winners across different industries who have demonstrated innovation and excellence in risk management. These key individuals see risk differently and have resolved risk-related problems in a unique or innovative way. Risk Innovators view risk not only as a threat, but also as an opportunity for their organizations. Active Agenda received Liberty Mutual's "Responsibility Leader" designation as another level of recognition to the Risk Innovator selection. This designation highlights a Risk Innovator whose leadership benefits a company's bottom line, while also making a positive impact on colleagues, customers and the community. A Responsibility Leader® demonstrates creativity, innovation and hard work and their efforts combine risk management success with responsibility. 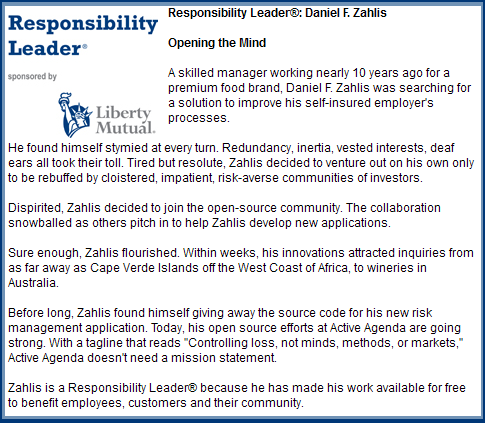 Liberty Mutual's Responsibility Leader® does what is right instead of what is easy.